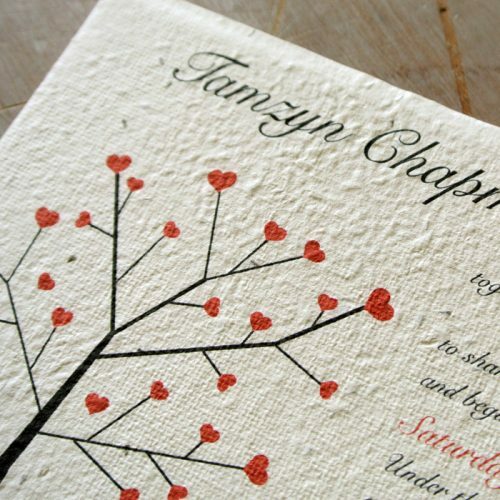 Plantable wedding invitations are a really unique wedding invitation. 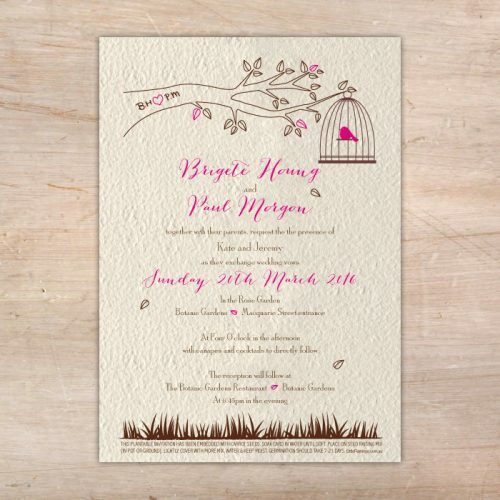 Perfect for a variety of wedding styles these eco friendly wedding invitations are sure to impress your guests and get them excited for your upcoming celebration. 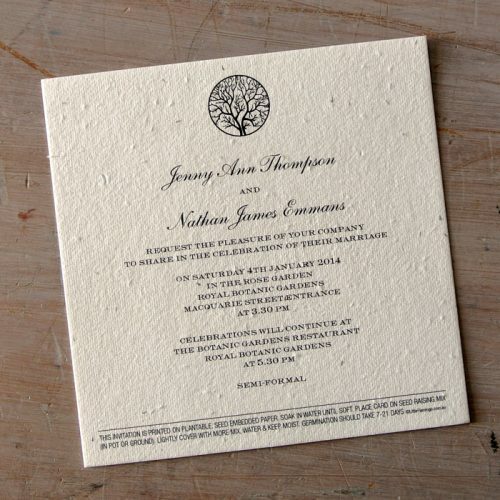 Our special handmade, seeded paper is made from recycled paper pulp which is embedded with your choice of seed variety. Choose from our range of seeds including: Basil, Carrot, Lettuce, Oregano, Parsley, Swan River Daisy, Thyme and Wild Rocket. Creating this beautiful paper is a labor of love, each of your plantable wedding invitations are unique with no two pieces of our seeded paper the same. This variety between paper is due to the handmade nature of this recycled and eco-friendly paper along with the distribution of the seeds throughout each piece. 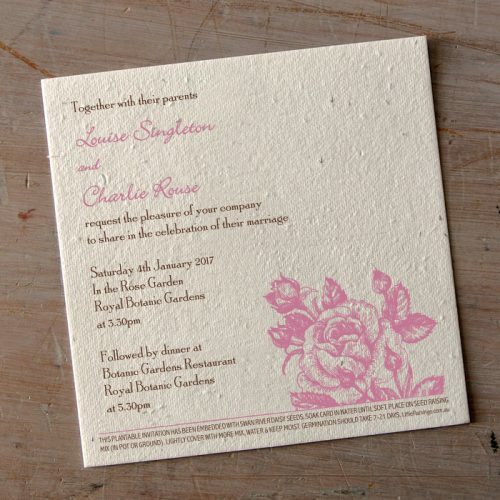 Not only that, but each variety of seed produces a different look to your plantable wedding invitations due to the different sizes, shapes and colours of the different seed types. 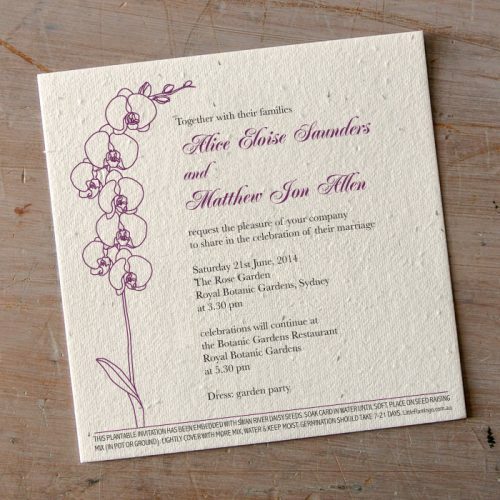 Your guests can grow their plantable wedding invitations (after your celebration of course!) 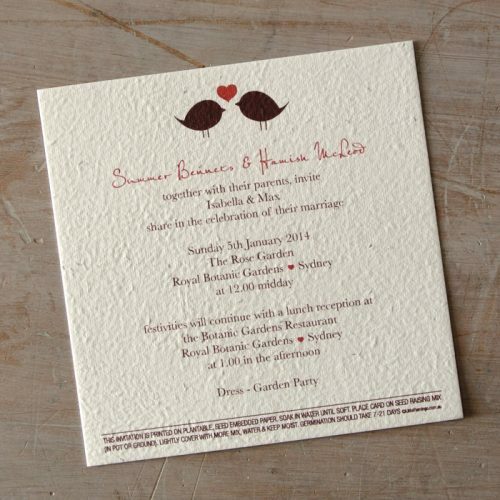 by following the instructions printed on their seeded paper invitation! super easy! Just think how lovely it would be, after your wedding to go over to a friends or family members home and they serve up a dish featuring the basil, parsley or even lettuce they grew from your plantable wedding invitations!